It’s a hundred days until Christmas, and 30 days until I turn 51. Around this time each year, I get a little giddy at the prospect of turning a year older. Better that than sulking about one’s age right? After all, not everyone is given the gift of growing older. And so I count my blessings everyday, more so when a birthday is fast approaching. A few days ago, I came across a 30-day writing challenge that was put together by my friend and Philippine Daily Inquirer colleague Pam Pastor for the Philippine Literary Festival (PLF) and I thought it was a pretty cool. I looked over Pam’s topics and thought the subject matter could use a little tweaking for men and women of a certain age to reflect on as one approaches another birthday. And because I’ve always believed in the power of reflective writing, I thought “Hey what better way to leave my 50th year ( a year that was both wonderful and wretched depending upon the month you are looking at) than to take pause each day, over the next 30 days and write my way to 51. So I put together a list of topics and please feel free to join me (share if you must, in the comments section below) on this 30-day writing journey. So let’s begin with this photograph from childhood. I must have been around 8 years old here. It’s September 1972, a few days before Martial Law was to be declared. 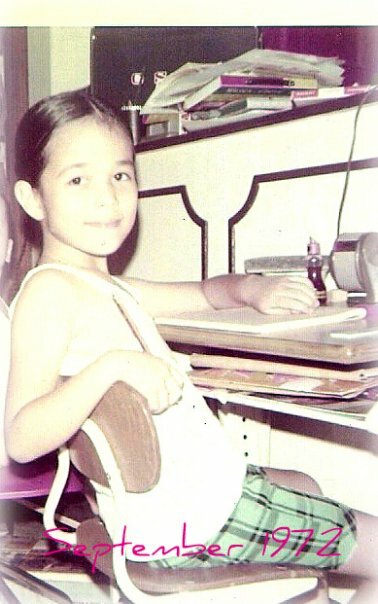 Here I am sitting at my desk, most probably doing homework — note the paper, the sharpener, and the glue. It must have been my dad who took this photo one early evening after school. Writing has always been my refuge. My way of making sense of the world. When I’m happy, I write. When I’m sad, I write even more. I love this photograph because this is really who I am. This desk was very precious to me. I had received it two Christmases before when I was six years old. I had asked/begged Santa to give me one for Christmas. I know. What child asks Santa for a desk for Christmas?! Well, that’s me. The desk, the chair, that little corner was my sacred space. It was where I read, wrote, sulked, smiled. The small desk gave way to a bigger one a few years later but the routine continued. On the big desk came a typewriter which my dad bought me when I was around 10. Words and I have had a long and lasting love affair. I guess it will remain that way until I have all my wits, and my memory, until I breathe my last. I’m going through transitions in several aspects of my life. Your 30-day challenge moves me to write my way through these transitions. Thanks for the inspiration. Yes, writing has always been my way. It also helps to ask the Divine to guide your thought and your pen. God bless your journey!